The days might well be getting shorter but as far as I'm concerned the middle of July is high summer. Not least in the heatwave we've been wishing for the last couple of years which we are now starting to moan about! It's far too hot to set out until the day is beginning to cool down at the moment. Far to hot even to move through most of the day. With the test Match finishing late yesterday it as gone seven when I fought my way along an untrampled path to a different water in an attempt to change my eel catching fortunes. After dropping my gear I had a look around, swatting at the biting flies which found my sweating arms attractive. 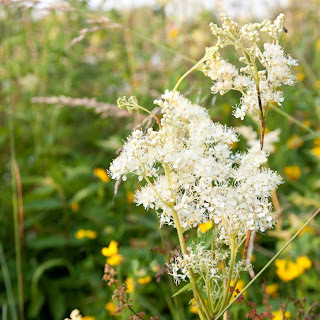 After finding a spot where the marginal weed wasn't too thick and a quick plumb around revealed a decent depth without too much in the way of bottom weed I hacked and trampled out enough space for me to set up my stall among the freshly blooming meadowsweet, umbelifers and slowly fading trefoil. The sickly smell of the cut vegetation permeated the sticky and still air as I cast out two deadbaits. 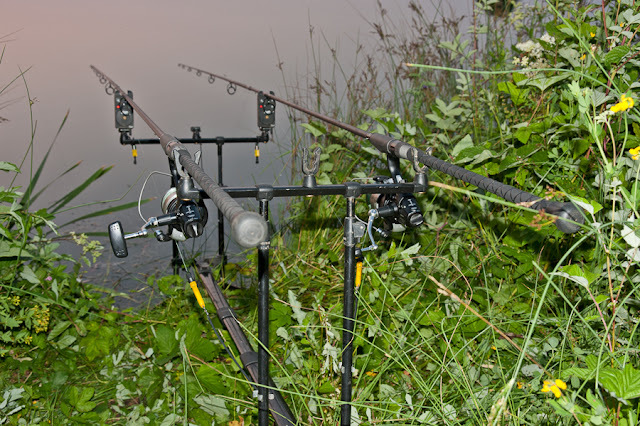 One legered on a decent chuck the other on a Dyson rig close to the marginal weed edge. Nothing happened while the heat was still in the sun. Bees buzzed and fed on the trefoil. The biting flies bit. Even sitting still listening to the radio I continued to sweat. Once the sun had (technically) set the water levelled right off to a flat calm. Damselflies sought out roosting spots in the reeds. The biting flies retired for the day while the mosquitoes whined in for the night shift. Bats came out and the alarm on the leger rod bleeped. the bobbin failed to drop, didn't even seem to twitch. I settled back. A few minutes later the alarm bleeped again.I checked the bait and dropped it a bit shorter. By the time it was dark I switched the sounder box off and relied on the LEDs to alert me to takes. The legered bait was the first to be interfered with. Another twitch that could have been eel induced, could have been a liner but probably wasn't given how lightly set I had the bobbin clip. Not long after that the other LED lit up briefly. Nothing, yet again. Then it lit for longer as the bobbin dropped off and the line pulled slowly off the reel. Then it stopped. I clipped back up. That was it. I stuck around until I began to nod off. Another frustrating eel session. I bet if I set my stall out to catch tench I'd be plagued by he buggers. Given this was on a different water has that been two blanks on the trot or just the one? I have to consider this given my three blanks and move on rule. I'm equally aware that when a dry spell arrives one of the worst things you can do is keep moving waters, or changing target species. Then again a change of species might do me good. Trouble is there's nowt else I feel like fishing for in this heat. Must try harder!